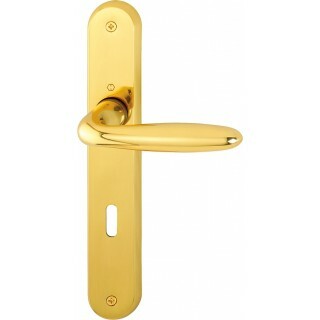 Interior door handle on plate Hoppe Verona series. Hoppe door handle for interior doors with plates to 239 mm in length. The material used in the manufacturing of components is brass, the return springs are made of steel. Available in polished brass finish even with Resista Protection, which is a protective layer applied on the surface of brass. Making the handle immune from weather, dirt and premature erosion. Simple mounting and does not require experience, since the new hooking system called quick-fit connection will simplify the mass in work. The price in the description means: a complete pair, rosettes, escutcheons and mounting accessories. All it boxed in original packaging Hoppe.